12-jar pack Hot Green Chile. 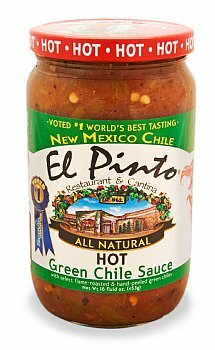 Huevos rancheros, enchiladas, chile con queso, meatloaf and green chile stew are family favorites with El Pinto Hot Green Chile Sauce. A 12-Pack of 16-oz jars of our one-of-a-kind hot green chile sauce. Huevos rancheros, enchiladas, chile con queso, meatloaf and green chile stew are family favorites with El Pinto Hot Green Chile Sauce. Just open the jar, warm and let your imagination run wild. 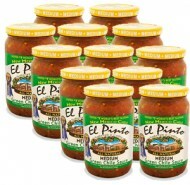 For the flavor of New Mexico it's got to be El Pinto Medium Green Chile Sauce!